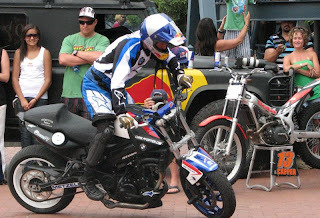 In a post shortly after our return from a short holiday in Wilderness at the beginning of the year I mentioned that we happened upon a demonstration by international and local motorcycle stunt riders. 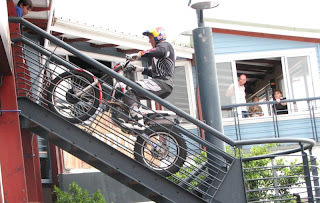 This unexpected entertainment took place at the Knysna Waterfront in a small area surrounded by the waterfront buildings and the quayside. We stayed to watch and I used the opportunity to test my Cannon S3IS camera's built in "Sport" mode. A few of the pictures captured at this amazing demonstration are posted below. 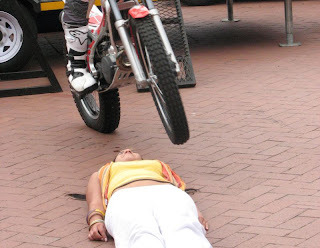 As an enthusiastic motorcyclist for many, many years I was keenly aware of the skill exhibited by these riders. Several of the stunts were performed using special lightweight trials machines designed to traverse "impossible" obstacles as riders compete to negotiate extremely difficult courses without putting a foot down. Each time a rider's foot dabs the ground to keep his balance he loses points. The winner is the rider with the highest points at the end of the course. 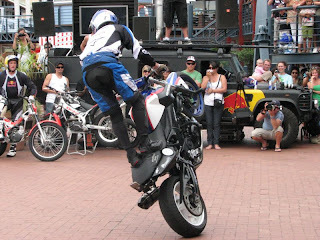 The rider negotiating a narrow steel stair with a 180 degree bend half way up and bouncing his front wheel over a prone, and remarkably brave, member of the audience used such a machine. However, as a rider of many larger, heavier machines in my motorcycling days I was astounded by the skill of Christian Pfeiffer riding a BMW F800GS off-road motorcycle. This is a big, 800cc, twin cylinder machine weighing over 200kg and yet such was his control that the machine and rider could have been a single entity. He spun the heavy motorcycle in circles standing it on its rear wheel or front wheel at will. His most spectacular stunt comprised accelerating across the tiny arena toward the same brave girl who had lain so still while the motorcyclists bounced and flew over her prone body and, at the last moment, bringing his big machine to a stop, standing on its front wheel, while he kissed the girl.